Clark Art Institute in Williamstown (Berkshire County), Massachusetts. 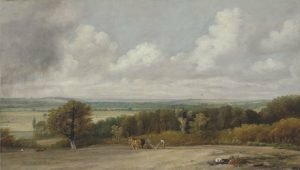 The exhibition, Turner and Constable: The Inhabited Landscape (Dec. 15, 2018-March 10, 2019), organized by curator Alexis Goodin is drawn largely from the Clark’s Manton Collection of British Art, created by Sir Edwin and Lady Manton and given to the Clark by the Manton Art Foundation in 2007, with additional works on loan from the Yale Center for British Art and the Chapin Library at Williams College. The exhibition has drawn national attention with glowing reviews appearing in the Washington Post (One Rivalry Changed the Landscape in English Art) and the Boston Globe (Rivalry and Revelations From Turner and Constable). The “Rivalry” referenced by these reviews is echoed in the words of Olivier Meslay, the Hardymon Director of the Clark, who notes that while both hailed from England and were associated with London’s Royal Academy- training in its schools and exhibiting in its annual summer exhibition- the two artists diverged in their choices of subjects, the way they handled paint, and their domestic priorities. 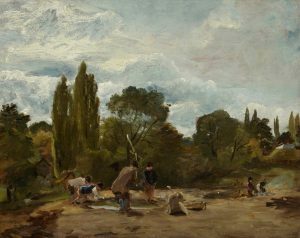 In the publication published by the Clark on the occasion of the exhibition, Turner & Constable At The Clark (Publications Department of the Clark Art Institute, Williamstown, MA, 2018), it is noted that Turner explored the far reaches of England, Scotland, Wales, and the surrounding sea, and made numerous trips to Europe, where he gravitated toward natural wonders such as the rivers of France and Germany and the Swiss Alps. 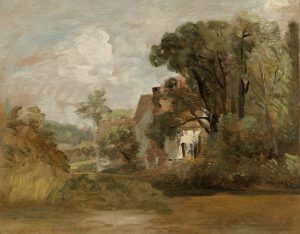 In contrast, Constable focused on the English countryside, often taking his subjects from the landscape around his childhood home of East Bergholt, Suffolk. And this viewer’s escape from the 21st Century into the pre-industrial agricultural world of Britain 200 years ago was rooted in careful examination of four extraordinary Constable paintings with their stunning details, particularly The Wheat Field (1816) on display in the second gallery (the section of the show entitled The Laborer In The Landscape) of four galleries. In this large oil on canvas painting (21 1/2 x 30 3/4 in. ), harvesters cut down the golden wheat with scythes, reapers bundle the stalks, and gleaners collect leftover grains, while a boy and his dog guard lunch. If a visitor to the show is fortunate to have a child along, the natural question to spark a conversation is “Against whom are the boy and his dog guarding lunch?” Scavenging dogs, perhaps, or wild animals, or some impoverished souls? And a conversation about the tradition of gleaning would also flow naturally from a close viewing of The Wheat Field. 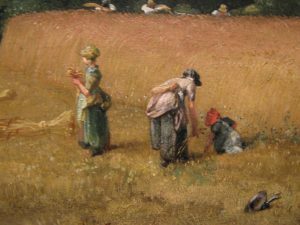 The highly recommended accompanying publication notes that the gleaners, the woman and child who bend down to collect stray stems of wheat (and the woman standing nearby) are the poor, who were, by tradition, entitled to follow the hired harvesters to collect stray wheat for their own sustenance. 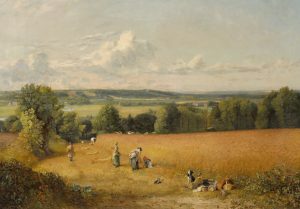 And this practice endured in Britain into the 19th century despite a judgment in a lawsuit brought in English courts in 1788 ruling that no one had a right to glean grain on private land. Some good agricultural news in our 21st century world is that gleaning of farm crops to provide food security for people in need has become a new and vital food movement as we reported last year. The Center for Agriculture and Food Systems at Vermont Law School has successfully implemented its praiseworthy National Gleaning Project. 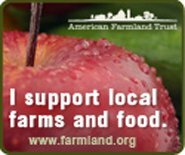 Information on the growing national network of fresh food recovery organizations across the country is available on the website of the National Gleaning Project. The other three Constable paintings which made this exhibition a must-see for this visitor are two, like The Wheat Field, on display in the second gallery (the section of the show entitled The Laborer In The Landscape). One of these paintings, Flailing Turnip Heads, East Bergholt (1812-15) stops most visitors in their tracks. What exactly is depicted in this oil on canvas (14 x 17 1/2 in.) as laborers swing baseball bat sized clubs at turnip heads? The best answer seems to be to release oil rich seeds to be fed to livestock. The other Constable painting in this second gallery of special note, Ploughing Scene in Suffolk (1824-25), is on loan from the Yale Center for British Art, Paul Mellon Collection. This oil on canvas (16 3/4 x 30 in.) shows in rich detail two farmers in a field, each behind a plow drawn by two horses, tilling the soil in late summer in preparation for a winter crop. In the final and fourth gallery (a section of the exhibition entitled The Built Landscape) is the painting, Willy Lott’s House (1812-13) which has a descriptive label that is a stunning reminder how fast the world has become in our age of jumbo jets and world-wide tourism and how a farmer’s life in early 19th century Britain was one of rural isolation. Willy Lott was a tenant farmer who worked nearly 40 acres of surrounding property to his house. He was born in the house and died there as well and local lore suggests he only slept outside its walls four times in his life. A very small (9 11/16 x 7 1/8 in.) gouache (opaque watercolors prepared with gum) by Joseph Mallord William Turner, Great Yarmouth Fishing Boats (1827), also caught this visitor’s special attention in the second gallery devoted to The Laborer In The Landscape. Yarmouth in Norfolk on the East Coast of England was an important port for the British fishing industry during Turner’s time. A careful viewing of this small painting (though this viewer wished a magnifier glass was available!) shows the foremost fishing boat with barrel like baskets attached to the exterior, outfitted to catch lobsters, with shrimp boats behind this more easily seen vessel. Lobster and shrimp to be table fare for what class of folks would be a fair question to ask. 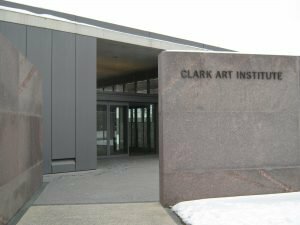 If readers are within traveling distance of the northern Berkshires, a winter visit to the Clark Art Institute is highly recommended.